ESA’s three-satellite Swarm constellation was lofted into a near-polar orbit by a Russian Rockot launcher this afternoon. For four years, it will monitor Earth’s magnetic field, from the depth of our planet’s core to the heights of its upper atmosphere. The Swarm satellites will give us unprecedented insights into the complex workings of the magnetic shield that protects our biosphere from charged particles and cosmic radiation. They will perform precise measurements to evaluate its current weakening and understand how it contributes to global change. 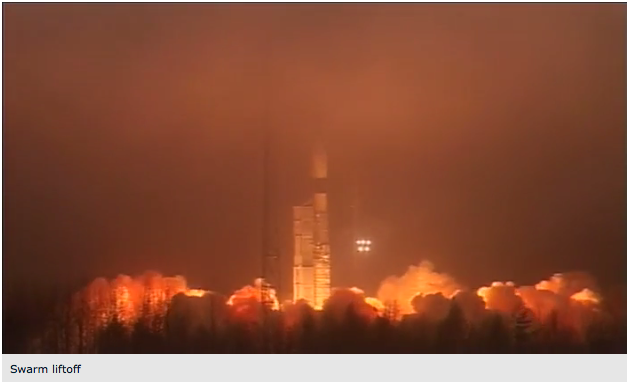 The Rockot launcher lifted off from the Plesetsk spaceport in northern Russia at 12:02 GMT (13:02 CET) on 22 November. Following the link, you can also watch a short video of the launch, or just click on the screen shot below. Congratulations to the Swarm Team and everyone involved! Well done! See also: BBC News "Esa's satellite Swarm launch to map Earth's magnetism". CINEMA 2 & 3 Launched!